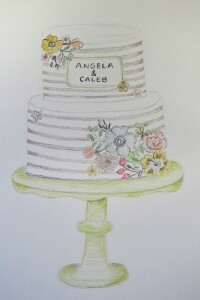 If you’re a frequent reader of our blog, then you probably know that we love to design cakes from invitations. After all, you go through the work of picking out the perfect invitation for your event so it’s got to mean something to you, right? 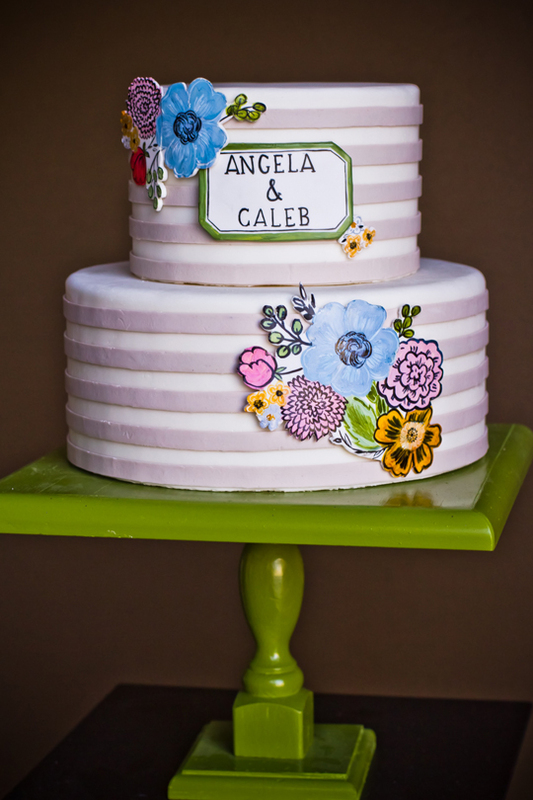 That makes it a great idea to carry the design all the way through to your cake. Plus, it means that you’ll always have an original, unique design. It’s those thoughts that went to into our 5th sketch to cake concept that we call You’re Invited. 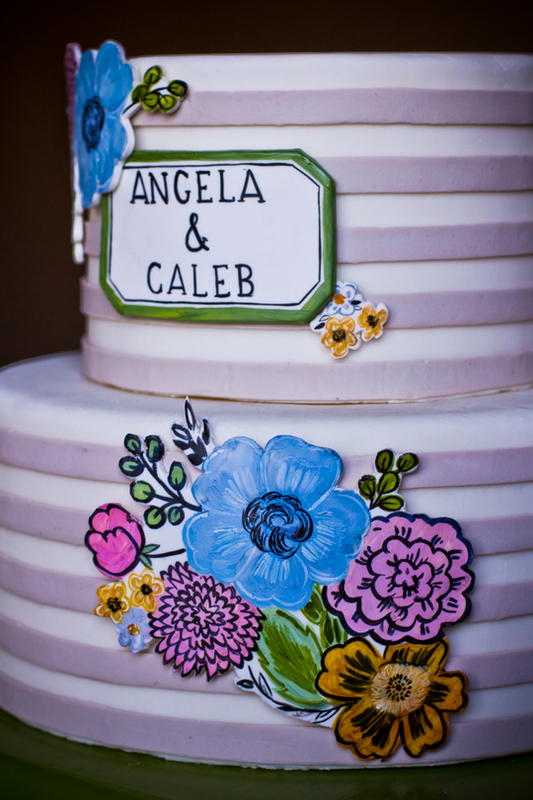 Since designing a cake from an invitation was the main inspiration, Katie set out to find the right invites. She discovered a bunch that she loved from Minted.com and ordered a sample pack. 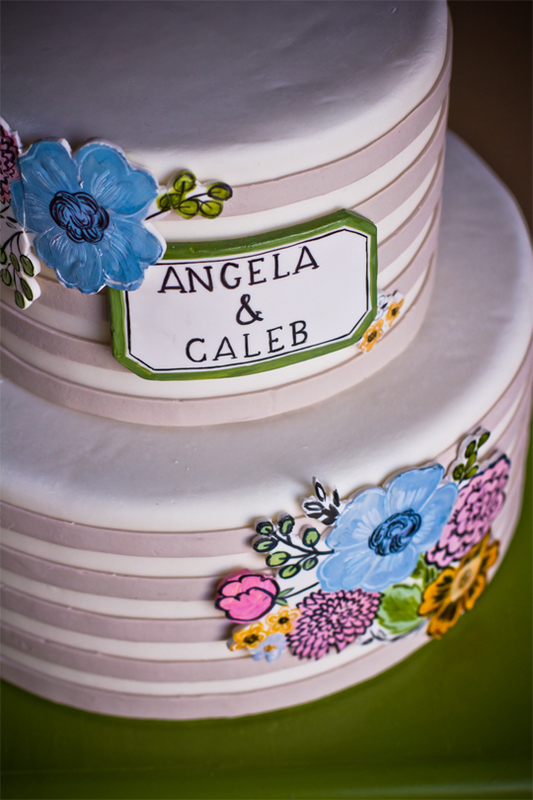 This pair, with gray horizontal stripes and bouquets of painted flowers was her favorite. Pretty instantly an idea came to mind. In the case of this invite, because of the specific stylized elements, the design was a very literal translation. Katie included gray stripes, painted flowers, and a plaque. 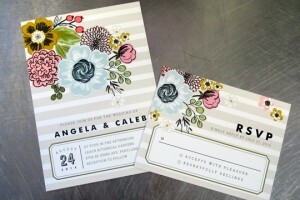 Sometimes this works for invitations, and sometimes the design is more thematic—either way works! But it’s how the whole cake came together that makes it so sweet and charming. With the exception of making some color adjustments, Katie didn’t stray much from her original idea. First came the gray stripes. Katie then cut out the shapes for the flowers and plaque. A few days later after they had hardened, she hand-painted every tiny little detail! Beautiful work. Bring us the invitation for your next event and see what we can come up with! Thank you Hannah Metler for the beautiful photos!